There might not be a lot of people who use table runners these days, but it won't stop me from making them! I have many reasons why I like making them. 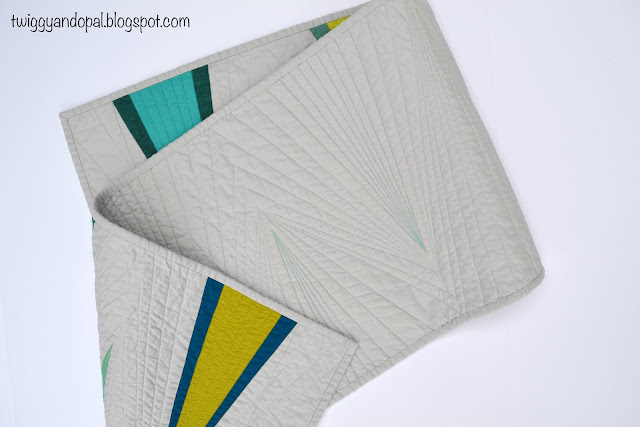 I even have a top three as to why I enjoy tossing a table runner in the quilt rotation! 1: they are quick. 2: I can use scraps. And 3: the size makes quilting fun! Also, it's a good way to try new ideas and use orphan blocks. But that's just the beginning! How about it's a good way to add color and texture to a room? It can certainly add a big pop of color and deliver a bold statement! That right there is reason enough! Here I was with this idea. The kind of ideas that you can't get out of your head until you do something about it. While I was designing it in my head, I knew it would make a much better table runner than a quilt. At least at this time. The one thing I wanted to have was two colors and crisp points. What better way to achieve that than paper piecing?! Simple! Not quite so simple. Doable...it would just take a little more time than I thought. I launched EQ7 and came up with a couple pointy blocks. This is where the simple came into play. I designed two blocks that were slightly different from each other. One worked one was a total fail! That's all fine. The next step was a layout. The possibilities are pretty endless. I got the block, I figured out the design, now I just needed the right sizes. If you look at the runner you'll see that they all vary. Width, height...I like a variety and it soon came together. With the plan solidifying, it was printing time. A few of the blocks were larger than a piece of letter size paper so taping was required. That's what happens when you want variations! When it all comes down to it, most of my time was spent designing, taping and picking color combinations for the shapes. The shapes are among the easiest to paper piece. Which made the process quick and fun! I picked grey, aqua, green and blue thread for the quilting. 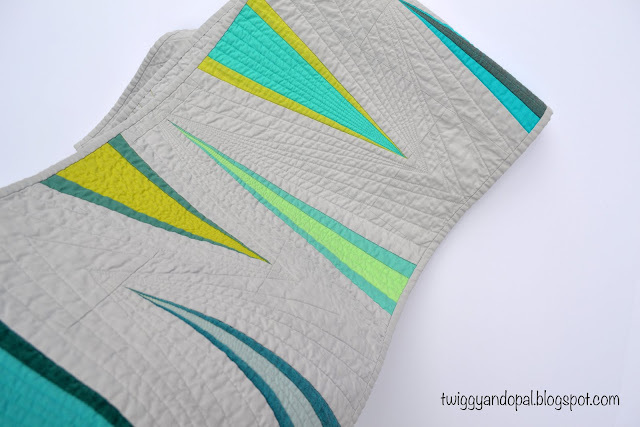 The center of the triangles were quilted using a coordinating thread (aqua or blue or green), and the background was grey thread all the way. Geometric straight lines were a breeze! That's why this size is always so much fun! My last quilting project was free motion stippling and I loved it. It was fast! But my heart belongs to lines, geometric, straight or otherwise! 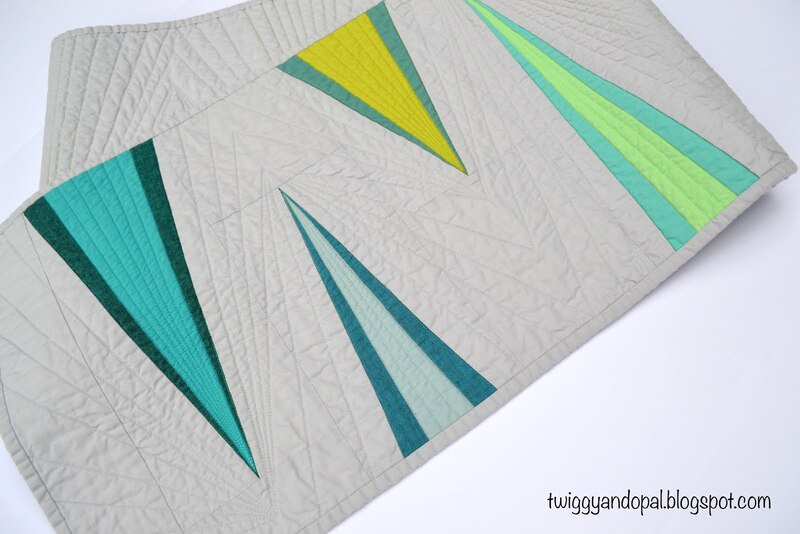 As much as I wish I would be more of an 'all around' quilter...we each like what we like! 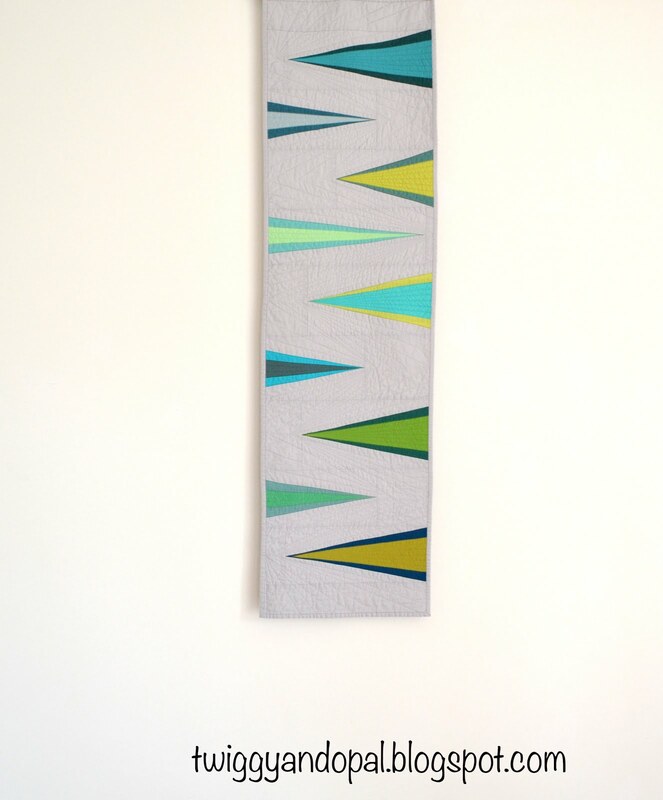 Now that I've 'sold' you on why you should make table runners, what's your experience or thoughts on the subject? Are you thoroughly opposed to the idea, make them and love it, don't care one way or the other ...or have you just been coaxed into giving it a try?! Don't forget protecting our table tops! Probably one the best reasons … and I neglected to mention it! I am definitely on the table runner bandwagon! They are such fun to make and I use them all over the house. I also give many of them to friends & family and they use them too. One of my favorite bridal shower gifts is a set of 6 or more runners with seasonal or holiday themes so they can be switched out through the year. I've gotten a lot of positive response when I give that gift. Your runner is fabulous! A striking table runner! Paper piecing always the best points. I have had table runners on my To Do list forever, but never seem to get around to them. I have two quilted placemats under plants in my living room and they clash horribly with everything else in the room, but I need protection for the table top. That should be a custom rectangular "runner" for sure. I have wanted to make a Christmas runner for a long, skinny sofa table where I set up my nativity set every year during Advent, but haven't done that yet, either. Part of the problem is that the colors and fabrics I'm drawn to for my quilting are not the colors that would work for these table runners, so there's nothing appropriate in my stash. 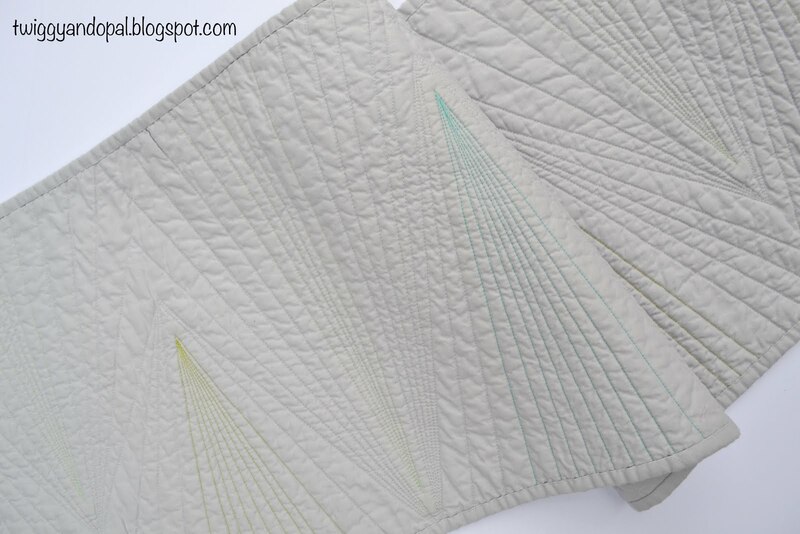 I would need to be really purposeful about it and buy fabric specifically for these table runners to make it happen! But I do love runners, and your pointy triangles are fabulous! Great design! I like table runners for all the reasons you mentioned, plus I can let the beautiful cherry wood of my table show, but it's still protected. I have several table runners in rotation - one is on my dining table right now and another under some potted plants in the living room. I'm still a fan! Oh and yours is lovely! I’m so happy to see so many people who are runner fans! I honestly had no idea! It appears I spoke to soon! I'm a big fan of table runners too! love this one a lot. I made a small table runner some years ago but something like yours will look really good on my new long dining table. Great pattern and quilting too. My biggest question about table runners is always size - what width and length would be best. That always seems to hold me back from doing them, but they are lovely! Congratulations on the lovely finish. That is a good question! I was going to mention size in my post but forgot! Many times the size depends on the blocks I’m using. I like to keep them 14-18” wide and length varies from 40-70” for mine! I love them. This year my goal is to piece one a month and quilt them the next month. So hopefully by Dec I will have 11-12 finished table toppers. Some will be holiday themed and some will just be where my mood takes me. Okay second try. If this is a repeat then please delete! Sometimes commenting on my phone is pita... I like runners for all the reasons you gave. Love your colours, and oh yes those pointy points!! Great finish - in both colors and design. I don't often make smaller projects. But I always find yours so inspiring! What a beautiful piece. You have inspired me yet again. NOT to make a table runner, though. My tables are covered up with too much junk, and nobody would see it. Wait! Maybe I could make a junk-cover-upper! Inspiration is inspiration table runner or not!! You might be on to something with a junk-cover-upper!! Thank you for making me laugh today! I make them all the time. Like you said, they are fast,and fun to quilt. I have three daughters with homes of their own so I make at least one or two a month. I believe that each one of your quilts is work of art - you can call it a table runner or a hot pad if you want. But (and this is the truth), I would not want anything to cover up those beautiful colors, those sharp points or that exquisite quilting. They'd look lovely as wall art, but if you want to put a plate of greasy beef stew on it, yikes - I shudder to think of it. Have a lovely Valentine's Day, my friend. Love this - great design! I, too, am fond of table runners, though they never go on my table cause it's oval. They just look weird. Instead, I have lots of counters, hutches, and coffee tables that need decoration! I love making and using table runners! Yours is so modern and chic!!! Beautiful. I never think to make runners. But I like the idea of a quick project. I think you've got all the angles covered in this post. It's a colorful and fun runner. Your runner is beautiful Jayne, I do love your working process, like you, I believe so called 'fails' are all apart of the fun! I also like a runner, and really looking forward to my kitchen finally being finished so I can decorate it with colour!! Another beauty! I love having a table runner. Not only does it add colour and texture to the room. 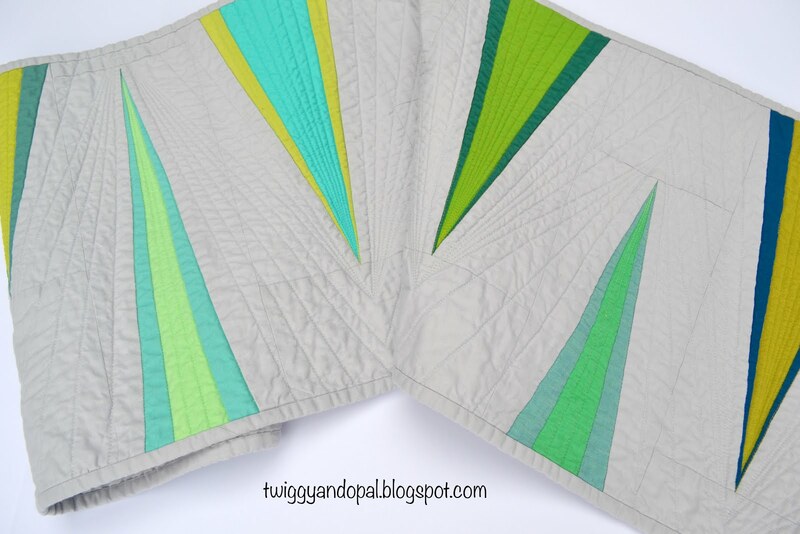 It also adds interest and can be a wonderful way to start a conversation about my fave subject - quilting! Love the sharp points and bursts of colour in your gorgeous runner! Jayne, I think this is such an awesome modern table runner. I personally love table runners. If you ever need someone to test this pattern for you, I’d be very interested! 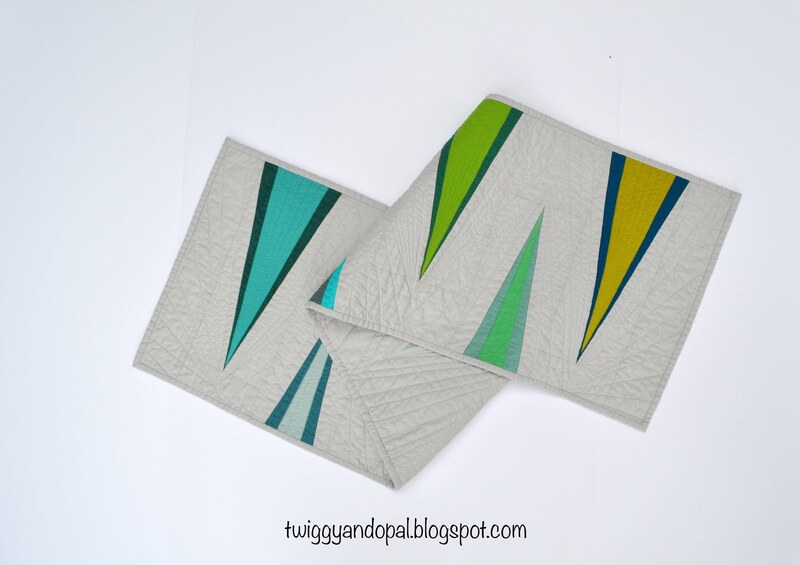 And those paper-pieced placemats you designed awhile back! Take care, Mary. I love table runners though I rather used them on my dresser ... The design of yours is very cool ! I like this. And this is the first table runner I have really liked. My furniture is very modern, and most table runners I see tend towards the traditional. This is real cutting edge!